It's been awhile since I last cooked pork sinigang. 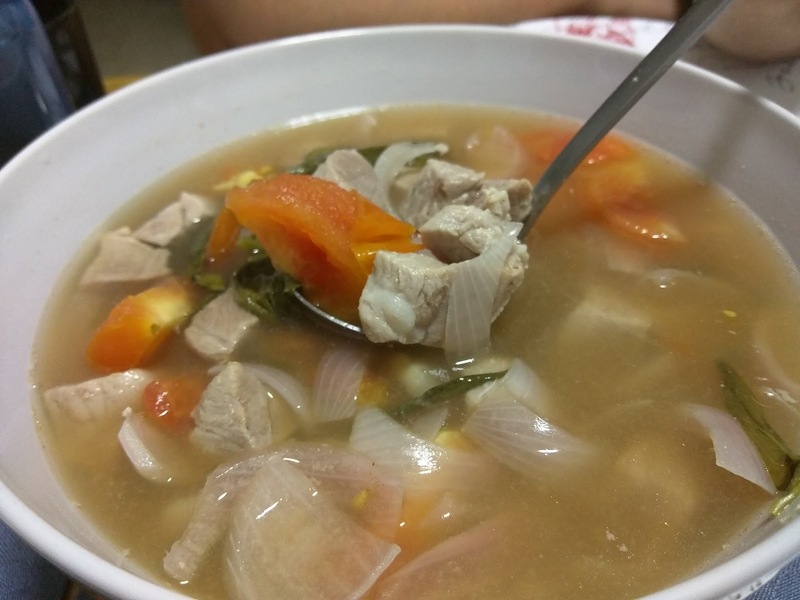 It's one of the easiest Filipino dishes to make as long as you have the sinigang mix which can be bought in any Filipino store (also available at some supermarkets out of the country). 1. Boil the pork in 4 to 6 cups of water. Add 1/2 tbsp salt. 2. When pork is a bit soft add the pork sinigang mix (usually after 15 minutes of boiling). Mix. 3. Add the gabi (optional, my boys don't like it that much). 4. Then add the cut tomatoes and onion. 5. In the last 2 minutes add the sili and kangkong. *You can also use salmon or shrimps instead of pork. Beautiful picture and congratulations too the happy new couple. may God keep on blesssing you beautiful memories in this beautiful journey you have embarked upon. one thing i must say the title suggested the adventures so i was very excited to see and read a little more about them but there were none to read about?? ?